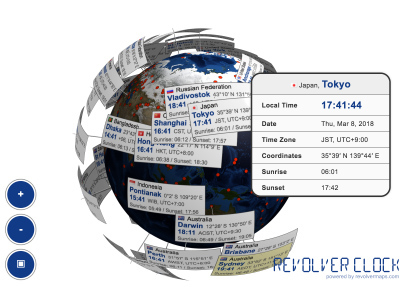 World Clock RevolverClock is developed by Daniel Seifert, Chemnitz / Germany. The globe uses map images from the NASA Visible Earth collection. Copyright © 2015 - 2019 by Daniel Seifert (Karma Implementor), Germany. All Rights Reserved.